Do I have a right to complain about the police? Yes. A police officer‘s job is to enforce the law but there are limits on their authority and how they should behave when doing their job. You have a right to be treated fairly. People under 18 and adults can complain about the police. When should I make the complaint? Do this as soon as you can. Talk to a lawyer, especially if the police have charged you with an offence. You can get free legal advice from Victoria Legal Aid or a community legal centre. the names of the police involved, their rank and station. Try to get these details when the incident happens. contact a lawyer who can help you make a complaint. See ‘Where to get help’ on page 38. Where or how should I make my complaint? All complaints about Victorian police can be made to the Police Conduct Unit. This is part of Victoria Police. The unit has a complaint form you can fill out on the Victoria Police website. You can also contact them to discuss your complaint. Go to the police website (www.police.vic.gov.au) and follow the ‘Compliments and complaints’ link. You can also complain directly to the officer-in-charge at any police station if you feel comfortable and safe doing so. You can complain to the Independent Broad-based Anti-corruption Commission (IBAC). IBAC is not part of Victoria Police. IBAC investigates serious corruption and police misconduct. They do not investigate everything and will refer most complaints to the Police Conduct Unit. They can also refer complaints to other places. You can make a complaint by using the online complaint form on the IBAC website. You can also call IBAC and ask them to send you a complaint form. You can make a complaint without giving your name. Go to the IBAC website (www.ibac.vic.gov.au) and follow the ‘How to make a complaint’ link under the ‘Reporting corruption’ header. You can make a complaint about the Australian Federal Police through the Commonwealth Ombudsman. They have a complaint form on their website. Go to the Commonwealth Ombusdman website (www.ombudsman.gov.au) and follow the ‘Making a complaints’ link. Can I take the police to court? You may be able to sue Victoria Police for compensation and damages if you believe you suffered a genuine wrong by the police officer. You will need evidence of your suffering and loss. These cases are usually very serious. Get legal advice as soon as you can after the incident. In general, you must take action within three years of the incident. See: What can I do if police have assaulted me? The Victorian Aboriginal Legal Service (VALS) can help if you want to complain about the police. Contact VALS to get information, support and free legal advice about your options. Contact a Victoria Police LGBTI Liaison Officer (GLLO) if you are worried about dealing with police officers or aren’t happy with how the police handled your complaint. . If you believe that a police officer treated you badly because of your race or religious background, you may be able to complain to the Victorian Equal Opportunity and Human Rights Commission or the Australian Human Rights Commission. You have rights, freedoms and responsibilities under the Victorian Charter of Human Rights and Responsibilities Act 2006. The Victorian Government and its agencies must consider these rights and freedoms when they make laws and provide services to the public. Victoria Police is part of the Victorian Government. For more information about the Charter, visit the Human Rights Commission website (www.humanrightscommission.vic.gov.au) or call 1300 292 153 (free call). If you believe your existing rights have been breached, contact Victoria Legal Aid or a lawyer. Note: international human rights law requires that an independent body investigates complaints of torture and ill-treatment by police. You are free to contact people on this list, or search elsewhere. These firms are listed because we believe that they undertake quality legal services in this area. The Police Accountability Practice is run in partnership with the Melbourne University Law Public Interest Law Program. 1. Of the 51 allegations filed through the clinic as complaints with Victoria Police during 2015, only 1 was substantiated. This is a 2% substantiation rate. 2. The most frequent allegation made was excessive force. 3. Complainants came to the clinic from around the State with the highest concentration in the inner-west. 5. There is a far higher demand for our service than we can provide. The full report with case studies is available here (PDF). This clinic is made possible by a partnership with the Melbourne University Law School’s Public Interest Law Clinic in which students support lawyers in public interest law organisations and directly assist in the delivery of legal services to clients. It aims to give students practical legal experience and provide the community with much needed additional resources for public interest law causes, particularly the provision of legal advice and assistance to disadvantaged clients. 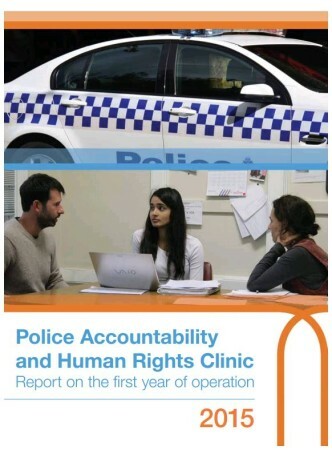 5) Collate and analyze statewide client data, utilise case studies, client stories and key cases for strategic systemic advocacy and law reform for police accountability and human rights. See: From the Classroom to the Clinic. VIDEO and Transcript: Twenty years ago, police turned up at Corinna Horvath’s home over an unregistered car. They kicked in her door and she was beaten up.